In one of my recent “Picks”, I came across an old camel back trunk. Wow what a piece of history. As I analyzed the features of the trunk, I found a patent date of 1888 and inside was a picture pasted to the lid which was easily dated to the late 19th century. An awesome $30.00 find! I am sure that one of the uses of this trunk was to pack your belongings as you traveled to the United States from another country. 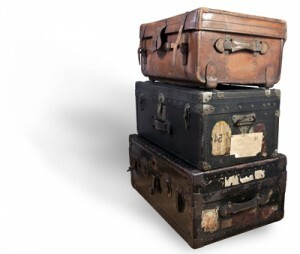 Many times people had to reduce their belongings to the size of the trunk and leave some very special family heirlooms back in the country where their lives began. Well, with that being said, it got me to thinking about some COBOL analysis projects that I have been involved with. Recently a customer came to us wanting to know why data in particular field was being truncated and what the impact of increasing the size of that field would be throughout their COBOL repository. Losing important data can have a huge effect on daily business just as leaving family heirlooms behind had a huge effect on families moving to the United States years ago! With the tools that we have developed and also existing tools, we can now quickly drill down to the specific lines of code and data fields that impacted this particular field and gain an understanding of what the impact to other fields, programs and data files would be if that field was increased in size. This can be done in a matter of minutes! Doug, really enjoying this series you got started here.